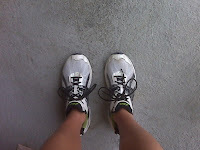 Finally had a chance to lace up the shoes again and head out for a run. It has been far too long since the last time I actually ran outdoors. The weather has changed and it is now getting hotter and more humid. I love it! Now that summer is coming back around, I am putting together another training plan... again. I am looking forward to this year, running and swimming my way back into some sort of race shape. Not sure when the next time I will race hard will be but I am going to enter a few races to stay active over the coming months. Can't believe I am a little sore from the 5 miler yesterday. Probably should have backed off the 7:15 pace.